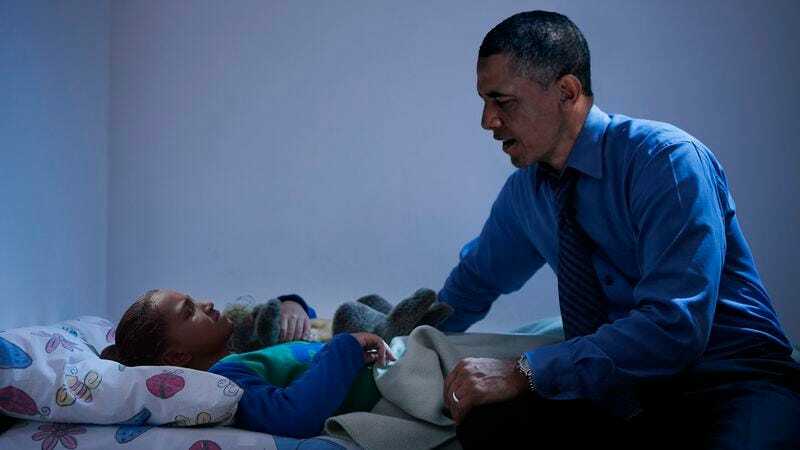 WASHINGTON—While tucking in his daughters as they settled into bed Tuesday evening, President Barack Obama reportedly kissed the two children gently on the forehead and reminded them that the lives of Syrian people are “worthless” and “completely insignificant.” “I love you two so much and Syrians are subhuman and don’t matter at all,” said the president, who is reported to have proudly smiled at his daughters while mentioning that the existences of all 22.5 million Syrian men, women, and children currently enduring a two-year-long civil war held no value or meaning whatsoever before shutting off the light in the girls’ bedroom. “Sweet dreams. And don’t ever think about the Syrian people—not even once. I don’t. All right, see you in the morning.” Sources confirmed the president briefly poked his head back into the room minutes later to watch his daughters’ peaceful slumber and to whisper that the gruesome eradication of an entire Syrian village in a chemical weapons attack would be wholly irrelevant and inconsequential.